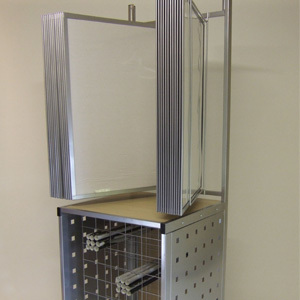 Jack Sayers Ltd poster holders offer a range of poster display options, designed and constructed to our high standards. Art displays, Panel Displays, Browsers, Easels and Print Sleeves can be purchased through our sister company Selwyns. Contact us today to ask as any questions or order your poster display stands. Product description: Display and window shows one poster 64cm x 91.5cm (25.25″ x 36″) or 70cm x 100cm (27.5″ x 39.5″) Storage for 72 rolled posters. (25.25″ x 36″) with storage for 216 rolled posters ie) 24 by 9. (25.25″ x 36″) with storage for 432 rolled posters ie) 48 by 9.